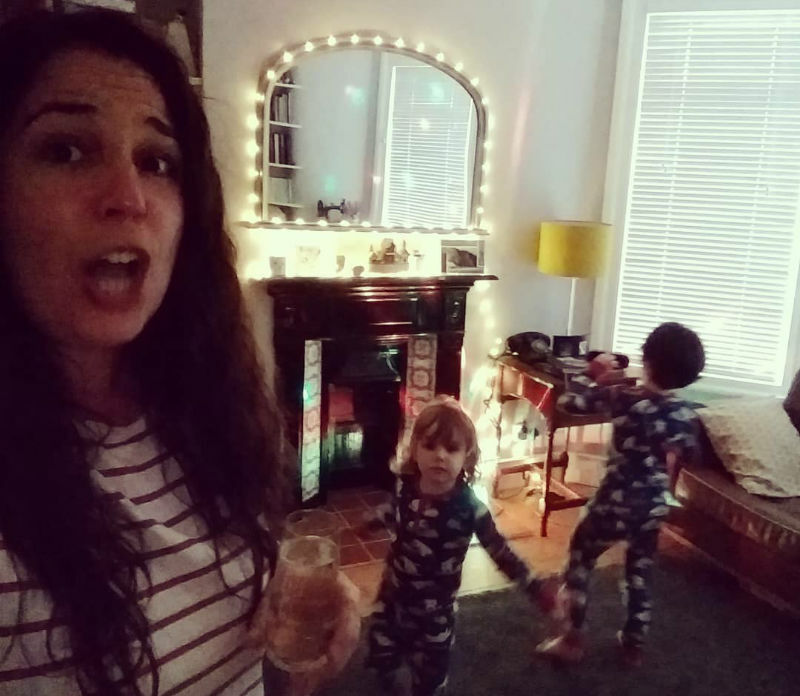 It’s basically a disco in the living room, best served with friends and lashings of Prosecco. And it’s excellent fun, for the kids and the grown-ups. When everyone gets home, eat some food. Make it something easy; freezer tapas, a pizza or a little buffet. Hangry kids and Pop Night do not go well together. Get some paper and pens out and let the small folks design a poster for the forthcoming event. Even if no one else is coming, it gives the whole thing a sense of occasion! Got a load of bubble wrap in the cupboard? We get loads from the beer and wine *cough* in our weekly shopping delivery so I tape a load of bubble wrap to the floorboards to create a bubble dance floor for the kids to leap around on. They burn off any excess energy and have fun making the bubbles pop. 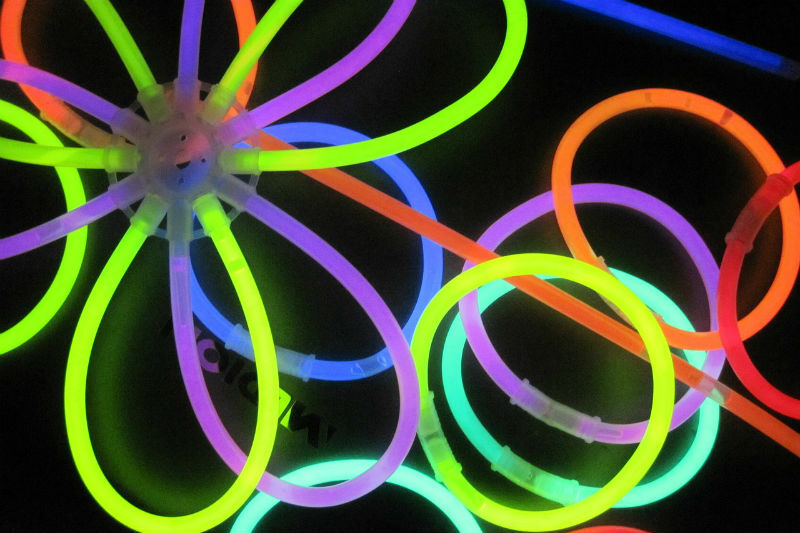 Glow sticks are so much fun and if you buy a little kit, they come with fittings to make glow stick necklaces, bracelets, belts, headbands, glasses, flowers – loads of stuff. Let the children activate the glow sticks and create some masterpieces. Don’t throw them away – the glow will still be going strong the next morning and even when it’s worn off, they’re still fun to make stuff with. Disco lights are SO cheap these days. You can get the bulbs that fit into your ceiling light but we got this one from Amazon for a tenner and it’s brill. You can stick on your favourite CD, pop on the radio or a music channel, or we made our own playlist on Spotify. It has a mix of kids’ favourites like Sleeping Bunnies, the Hokey Cokey, Baby Shark and Let It Go, plus a load of eighties and nineties party tunes for their musical education. In fact, here’s one of me singing Let It Go while the kids bust some moves. We do Pop Night even when it’s just me and the kids, but it’s even better with friends. The children love making the posters and glow sticks together, and then having a bit of a boogie and it’s great fun to have a drink and a chat with some mum mates while they play. You might have children who naturally want to boogie whenever some music comes on but if they are a bit shy, you could play some games or lead the way. We take it in turns to be the dance leader, and everyone has to copy whatever dance moves the leader does. It can be exhausting but it’s so much fun. Mooning happens frequently and does not have to be copied if you’re a grown-up. And that’s it – the dancing bit is brilliant fun, but so is the getting ready, everyone working as a team, doing art and craft and most importantly, learning how to party! Disclaimer: The Motherload® earns a teeny tiny amount of money from any purchases made through the affiliate links in this blog, which goes towards the upkeep of this site.